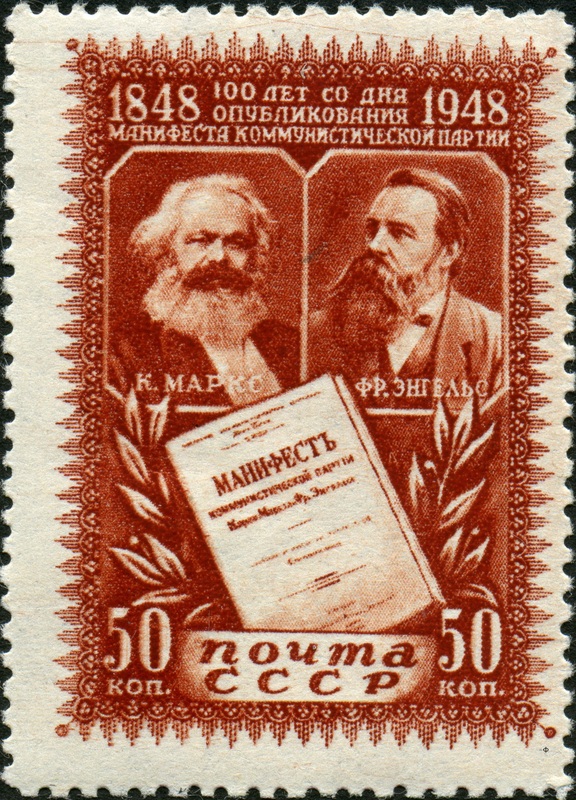 This entry was posted in Uncategorized on July 7, 2015 by Gavin Sharp. There is now over 400 people registered for Sunday, so down to the last few places. The day basically repeats itself so if you want to read the displays without music (and get some lunch) come down around 2pm and if you stay until 6.30pm isn you should see everything. If you want to have supper and stay into the night, come down sometime around 6pm – the displays will still be up but perhaps not so easy to read! Weather is still looking good, so we expect it will be busy so if you still have not registered please click on the link below. There will be merch for sale, so if you want to pick up a copy of the CD sampler, Jennifer Reid’s book or a T-shirt please bring cash as cards will be difficult to process. We will be doing a bundle of all three items for £20 to give you a bit of a guide. Parking is available in several car parks in the streets on the opposite side of Rochdale Rd, between Swan Street and Thompson Street. Again, there is a map on the registration page if you click the link. Any other queries, please message and we will try and get back before Sunday. See you all then! This entry was posted in Blog, Uncategorized and tagged Edward II, Gigs, manchester's improving daily on July 3, 2015 by Gavin Sharp. 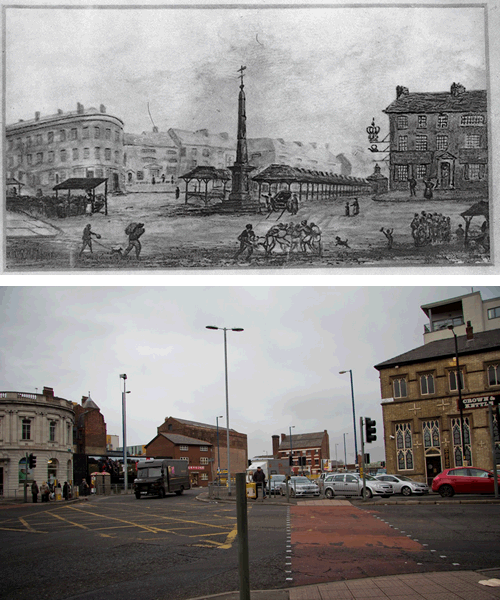 New Cross – one of Manchester’s lost locations. 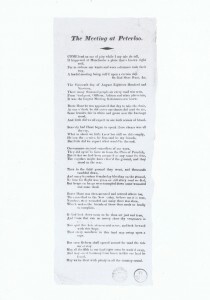 New Cross was a centre of production for penny broadsides in the eighteenth and nineteenth century, with several printers based around Swan Street. Some of the building around Chadderton Street and Cable Street date from this time, but none of the printers businesses survive. However, ask most Mancunians aged under 60 where the area of New Cross is, and the only reaction you are likely to get is a blank stare. Until the 1960’s, the area around the junction of Tib Street, Swan Street and Oldham Street was a well known, and quite distinct, district of Manchester called New Cross. The original Victorian trams stopped here on the way out of the city centre towards Oldham, and the name would have been as familiar s Ancoats, Beswick or Ardwick. 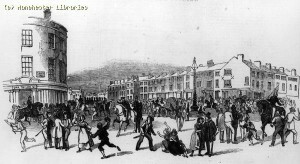 Historic maps of the area show that Swan Street was originally named New Cross Street, and that there was a physical cross, perhaps even an old market cross – although this is unclear – located in the centre of the junction opposite the Frog and Bucket and the Historic Crown and Kettle pub. The records show that there was a pub on the corner as early as 1734. The New Cross name is perhaps best associated nowadays with the shop on Tib Street that sells ex-army gear, a ‘destination shop’ for several generations of Mancunians looking to buy their first pair of docs, or maybe some waterproof clothing for a festival. There is also the nearby New Cross Dental Surgery, and it is often the case that when place names that have otherwise fallen out of use, they live on in the names of nearby buildings or businesses. 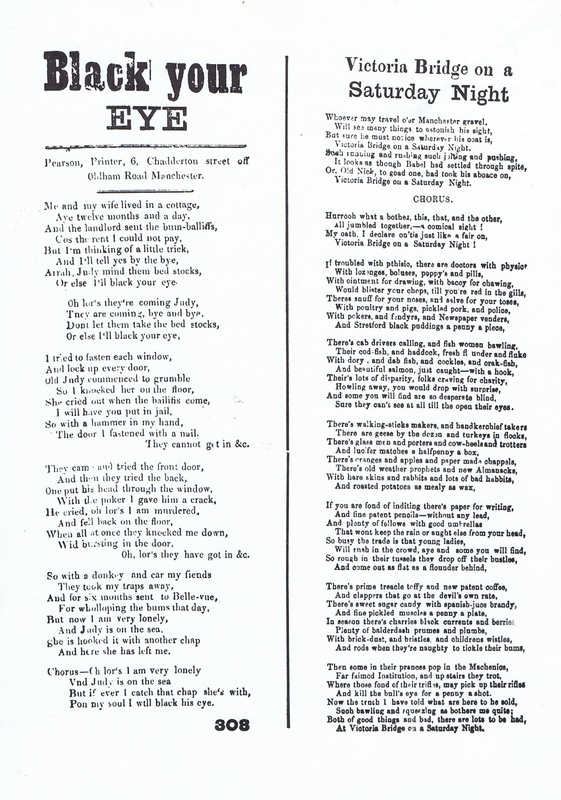 This entry was posted in Blog, Manchester's Improving Daily, Uncategorized and tagged Edward II, manchester's improving daily on June 26, 2015 by Gavin Sharp. 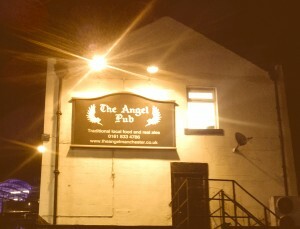 The Angel Pub, where we perform on 5th July and which also features in the song ‘A soldiers Farewell to Manchester’ (one of the better known of the Manchester Broadsides), sits on the boundary of a neighbourhood Angel Meadows. Now thoroughly re-developed, many of the buildings and streets still retain titles reminiscent of its less than illustrious past. In fact this is the part of town that Marx and Engels would walk into from Ancoats and Swan Street where they reportedly sat in the pubs looking over at the poor souls working the gravel pits on the edge of Angel Meadows. In fact Freidrich Engels described this residential neighbourhood as a ‘Hell on Earth’ and we can only imagine how horrific it would have been to live there. However, three hundred years ago, Angel Meadow was a heavenly landscape with views over fields and hills. Indeed, the name conjures an image of some pastoral idyll. 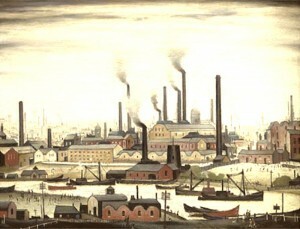 By the mid-19th century however, thanks to Manchester’s new industrial age, it had become one of the city’s worst slums. 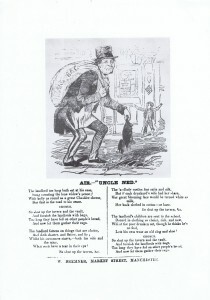 Angus Reach, a London-based journalist, visited Angel Meadow in 1849. Such is the Old Town of Manchester.. and the frightful condition of this Hell upon Earth. Everything here arouses horror and indignation. Bounded by Rochdale Road, Miller Street, Cheetham Hill Road, and Gould Street, Angel Meadow covered 33 acres on the edge of the city centre. 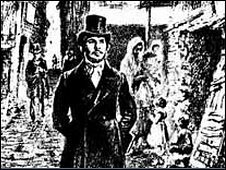 Its population of 20,000 to 30,000 was made up predominantly of destitute Irish who had fled the Great Famine to find work in industrial Manchester and now lived in squalid conditions in cellars beneath lodging houses. 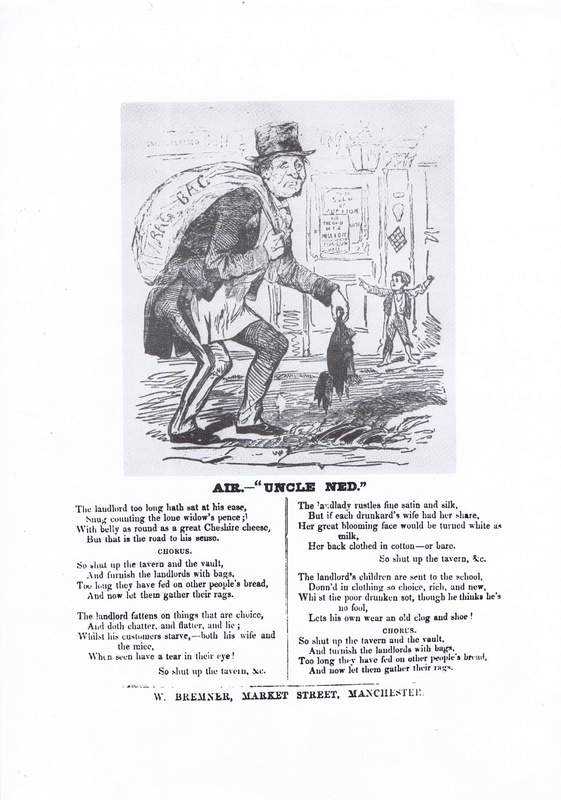 Quotes courtesy of The Gangs of Manchester by Andrew Davies and The Condition of the Working Class in England by Friedrich Engels (1844). This entry was posted in Blog, Manchester's Improving Daily, Uncategorized and tagged Edward II, Manchester Heritage, manchester's improving daily on June 20, 2015 by Gavin Sharp. Heaven knows I’m miserable now : Mancunian Social Identity portrayed in the arts. The paintings of LS Lowry are perhaps one of the best known examples of art reflecting northern life in the dying days of heavy industry. Lowry painted what he saw first hand, often producing subdued images of “faceless figures, over-sized factories, underfed bodies and drab housing” (Winterson 2013) that evoke the poverty and deprivation common across Salford and Manchester. Crescent have all revealed the remains of the slum housing that blighted the lives of workers during the industrial revolution. 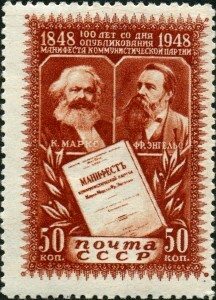 It is well known that the works of Marx and Engels are rooted in the conditions they observed whilst living in the Angel Meadow area of Manchester, and Engels despaired at the slum housing and harsh conditions endured by Mancunians when he wonders how “such a district exists in the heart of the second city of England, the first manufacturing city in the world.”(Engels 1846: 65). Most of the buildings from this era have been lost to gentrification, development and demolition, but where they remain they provide evocative indicators of the way social identities were played out. In public spaces, this was via the demarcation of clear – and often clearly labelled – social spaces such as markets and licensed premises. The Angel Inn, on the edges of Manchester’s trendy Northern Quarter, is a perfect example. Although much altered and rebuilt since the Angel Inn of the eighteenth century, this is the site of the pub that is mentioned in the 1859 version of ‘The Soldiers Farewell to Manchester’, the first broadside in the Manchester Ballad collection. Today, the Angel Inn stands in the middle of the area dominated by the new ‘Noma’ development by the Co-operative group, with apartments and plush office blocks now surrounding the pub. 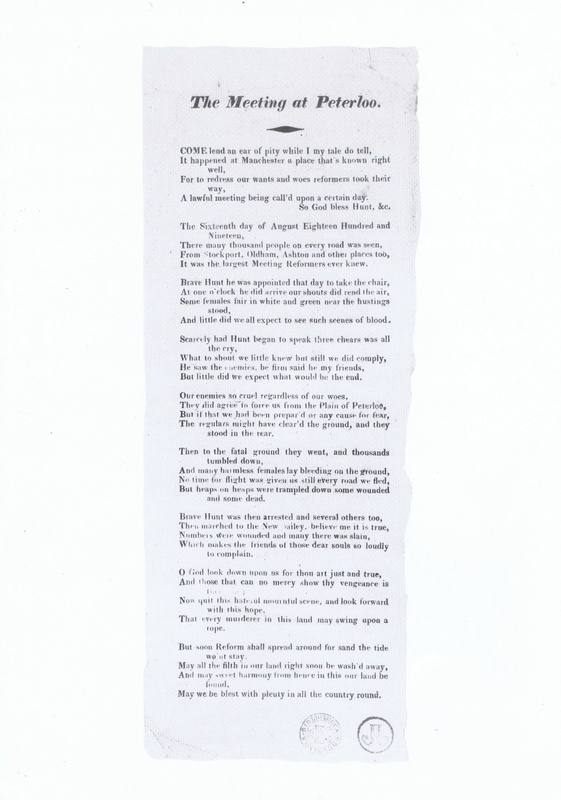 When the Angel Inn was opening, it appears that Swindels Printers were commissioned to print a partially re-written version of a much older song as a form of advertising for the opening (Reid 15). The message within the ballad is clear – The Angel Inn is the place to meet the prettiest girls in Manchester. 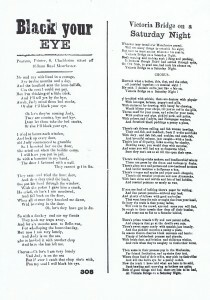 The rest of the song is a variant on a common theme, with a girl vowing to wait in chastity for the return of her true love. This entry was posted in Blog, Manchester's Improving Daily, Uncategorized and tagged Edward II, Manchester Heritage, manchester's improving daily on June 5, 2015 by Gavin Sharp. 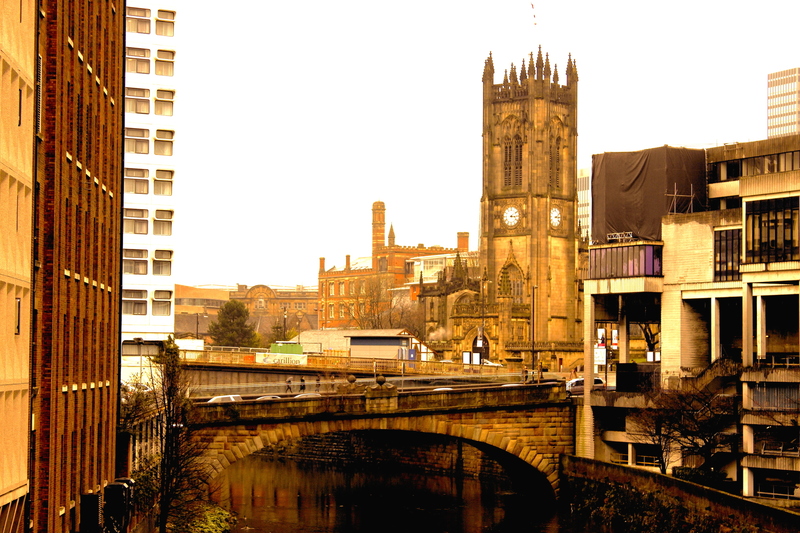 Victoria Bridge is a stone arch bridge in Greater Manchester, England. Completed in 1839 and named after Queen Victoria, it crosses the River Irwell, connecting Salford to Manchester. 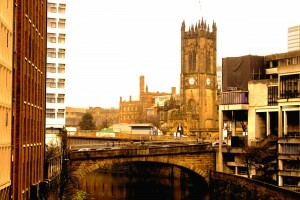 The bridge replaced an earlier medieval structure, Salford Old Bridge, which dated from the 14th century. The old bridge was built on the site of an ancient ford, from which Salford took its name. Contemporary accounts of its design are complimentary, but by the 19th century its narrow construction was viewed as an impediment to traffic, and it was demolished. Construction of the new bridge began in 1838, the year of the great gathering on Kersal Moor. 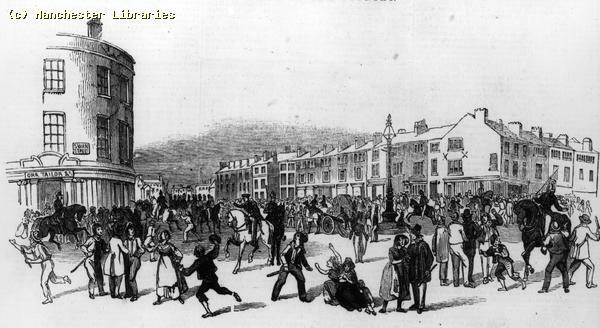 It is mentioned in the reports from the time that the throngs marched passed the construction site on their way to Bury Rd and on up to the Moor. 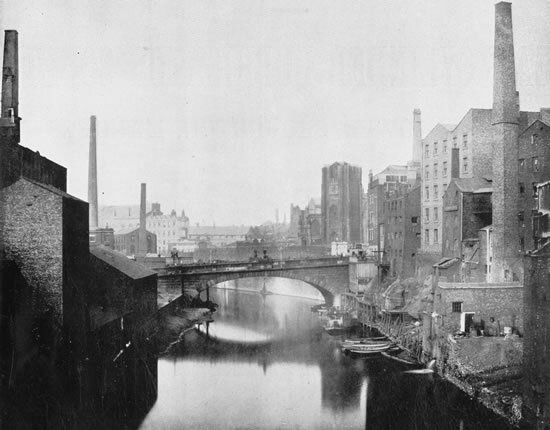 At the time, this was the heart of the city, where the gin houses attracted the crowds and street traders filled the streets, all trying to make a living in the rapidly expanding city, connecting Salford with Manchester and joint the two towns together. The lyrics of the song ‘Victoria Bridge on a Saturday Night’ describes it as well as anything else. This entry was posted in Blog, Manchester's Improving Daily, Uncategorized and tagged Edward II, Manchester Heritage, manchester's improving daily on June 4, 2015 by Gavin Sharp. Sadler worked as a pastry chef in the family business, The Lemon Hall Refreshment House, a small shop in Oxford. Sadler was the second person to make a balloon ascent in England, very soon after the Tuscan Vincent Lunardi‘s flight on 15 September 1784 in the grounds of the Honourable Artillery Company at Moorfields. 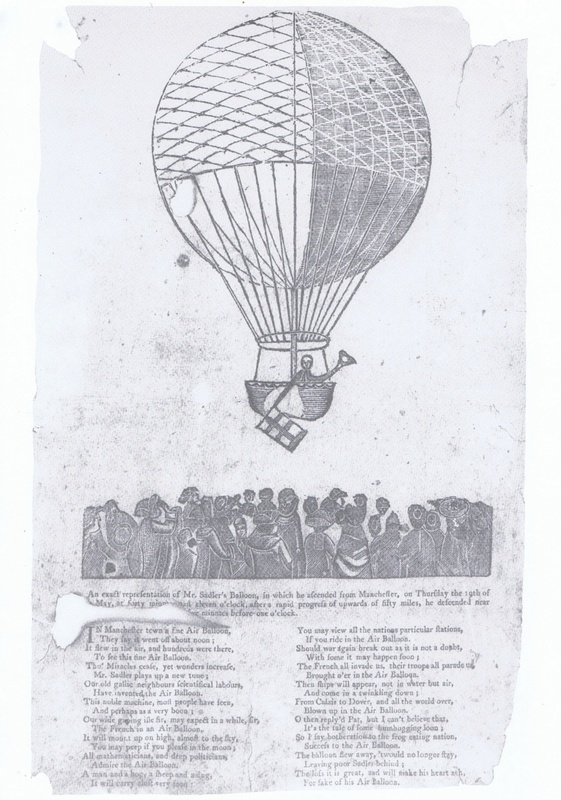 However, James Sadler was the first English Aeronaut having made his ascent during the month after on 4 October 1784 from Christ Church Meadow, Oxford. The balloon rose to about 3,600 feet and landed near Woodeaton, around six miles away. His second ascent on 12 November, this time in a hydrogen-filled balloon, reached Aylesbury in Buckinghamshire after a twenty-minute flight. In May of the following year he took off near Moulsey Hurst, Surrey, accompanied by W. Wyndham MP, hoping to reach France, but in fact descending in the Thames Estuary, and thus failing to repeat the earlier exploit of Jean-Pierre Blanchard and his passenger. Sadler made two further ascents in May 1785, the first of which was from a field behind a gentleman’s garden on the site of what is now Balloon Street in Manchester. On this flight he was accompanied by a cat and landed in Radcliffe. On his second ascent he travelled alone and having risen to 13,000 ft. travelled 50 miles before landing near Pontefract, West Yorkshire. On this occasion, he sustained bad injuries after being dragged for around 2 miles by the balloon, which eventually threw him clear before taking off again empty. This entry was posted in Blog, Manchester's Improving Daily, Uncategorized and tagged Edward II, Manchester Heritage, manchester's improving daily on June 1, 2015 by Gavin Sharp.